LAMINATED doors and panels are a 16mm, moisture resistant, medium density board (MR MDF), available in many colour options from bright whites and softer tones, across to vibrant colours, contemporary patterns and realistic wood grains with finishing options of satin or high gloss. This elegant door option comes with a tough, impact resistant, 2mm thick ABS edging, adding smooth rounded edges and a textured finish to your colour laminated doors. This edging comes in a range of colours to coordinate and compliment your cupboard colours, to create clean lines and a modern finished look. Vinyl Wrap doors and panels (made by Polytec ) are made from profiled 18mm moisture resistant MDF. 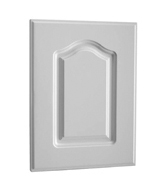 They have a smooth moulded edge with a tough thermoformed durable surface making it resistant to chips, catches and scratches, especially from all the usual knocks and bumps of a busy household. The face boasts with a decorative surface, resulting in a stylish fully-profiled door with an excellent resistance to impact. 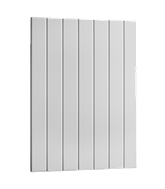 These doors are available in range of colours, profiles and surface finish options. Your new kitchen will remain a show piece for years to come. Polytec provide a limited seven (7) year warranty on all door products which insures against design, workmanship & manufacturing defects. 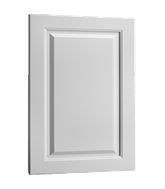 POLYURETHANE doors and panels are a versatile 2 pack finish used to create a simple yet classy, modern look. Available in a wide range of colours, styles and gloss levels to suit your individual home and personal taste.Door face styles include, a plain faced design with a selection of edge finishes available in high gloss, semi gloss, satin, matt or metallic. 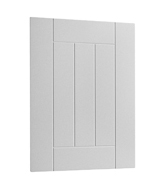 On the other hand there is a selection of raised panel styles with moulded inserts to suit every home. Polyurethane finished doors are easy to clean and maintain, giving you a long lasting, crisp, clean look all year round. SOLID TIMBER doors and panels provide a look that is contemporary, traditional or country style. Natural timber has a rich distinctive appearance with unique colour and grain variations. DGI solid timber doors are ideally suited for kitchens and wherever the accent is on achieving a warm, homely atmosphere. ALUMINIUM framed glass doors allow you to reflect the latest European trends in your kitchen design by creating highlights or display features. 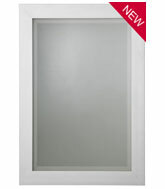 With four choices of safety glass inserts, they are offered in both slim and wide contemporary profiles. 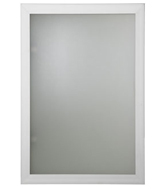 The frames are precision made to your exact sizes, and supplied with quality hinges.